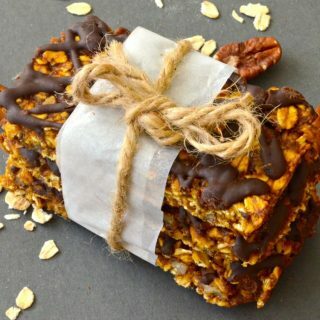 Deliciously soft & chewy, pumpkin granola bars with pecans & chocolate. Vegan, gluten free & perfect for Fall! And so the pumpkin recipes begin! I have a few awesome pumpkin themed recipes planned, and this is the first. In case you haven’t gathered, I am a massive pumpkin fan. There is just something about their cute pudginess that makes me smile. I love going to the local pumpkin patch to pick my pumpkins. 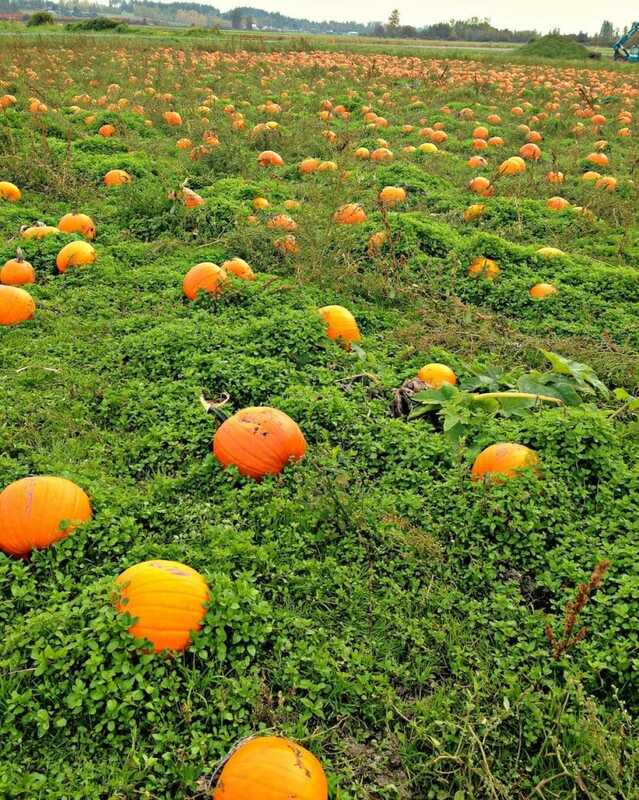 Pumpkins as far as the eye can see in all directions! My son is past wanting to decorate pumpkins for Halloween, and in his words wouldn’t be seen dead at a pumpkin patch so I tend to go alone, or drag my poor husband along for company. I will never be too old for pumpkins! Once I have my pumpkin stash, I tend to make my own puree as I need it. I literally just cut my pumpkin in half, scoop out the seeds and place the two halves face down on a baking sheet covered with either baking parchment or a Silpat. I then roast on 380 until soft. Once the pumpkin has cooled down I scoop out the soft flesh and store it in mason jars in the fridge until it is needed. If you can’t be bothered to do this then canned puree works just as well in this recipe. These Pumpkin Granola Bars with Pecans & Chocolate are deliciously soft and chewy. The crunchy pecans add great texture and the flavour goes so well with pumpkin. The bars themselves aren’t too sweet so if you decide to make them without the chocolate then you might want to add a little more sugar (1 -2 tablespoons more max). With the added chocolate drizzle the balance of sweetness is perfect. 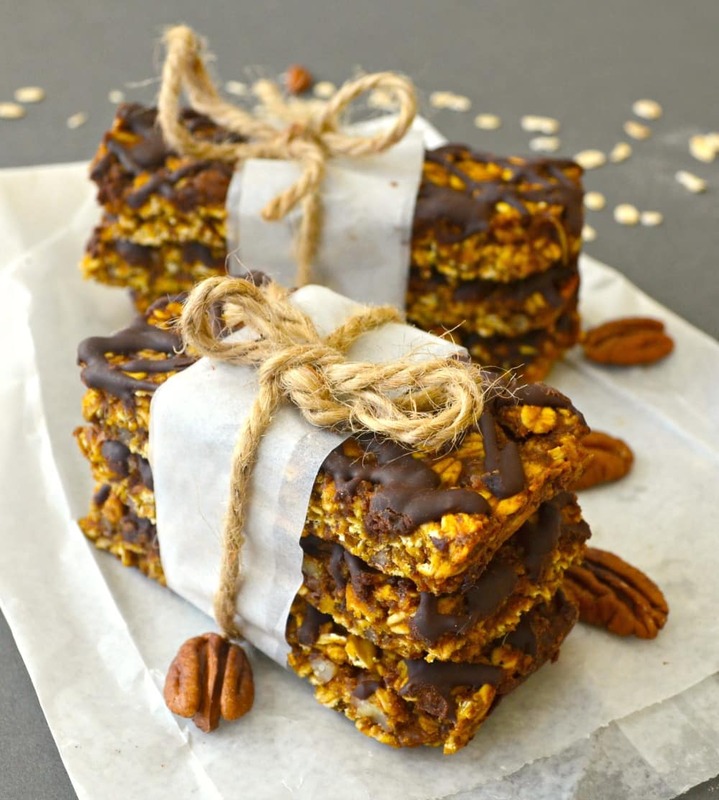 I would love to hear what you think of these Pumpkin Granola Bars with Pecans & Chocolate so please leave your comments below. If you are on Instagram feel free to share your pictures with me (@avirtualvegan). I love to see your versions of my recipes. Add the hashtag #avirtualvegan so I don’t miss them! Deliciously soft & chewy, chocolate drizzled pumpkin & pecan granola bars. Vegan, gluten free & perfect for Fall! Line a 8 x 8 pan with baking parchment so it hangs over the sides. Add all the dry ingredients EXCEPT the sugar to a large bowl and stir well. Add all the wet ingredients and the sugar to a small saucepan. Heat over a medium heat, stirring frequently until everything has melted and is well combined (this takes a couple of minutes). Pour the liquid ingredients into the dry and stir really well. Pour into your prepared tin and press down evenly all over. Add to the preheated oven and bake for 20 minutes. Remove and leave to cool in the tray for 30 minutes. Cut into 10 pieces. A pizza cutter works very well for this. Add the milk and chocolate chips to a small bowl and melt gently over a pan of simmering water or very carefully in the microwave. Drizzle over the top of the bars and refrigerate until set. If you want to make the granola bars nut free then omit the pecans and add 1/3 cup of extra oats or some pumpkin seeds to compensate. If you cannot get hold of rice syrup then agave nectar would be a good substitute. Also in the UK Golden Syrup would work. If you use any of these substitutions I would omit the sugar from the recipe as they are all sweeter than rice syrup. If you cannot get Pumpkin Pie Spice where you are, it is very simple to make yourself and great for adding to all sorts of baked goods like apple pies or cakes. Here is a very simple recipe which uses the same ingredients as my pumpkin pie spice and you probably already have the spices in your store cupboard. These granola bars are best stored in an air tight container in the fridge. They will keep for a couple of weeks that way. Bought my first pumpkin today, so cute I really don’t want to use it. However, can I substitute Date Syrup for the Brown Rice Syrup?…..I might have to buy me another pumpkin to keep on my counter. Date syrup is a totally different consistency and might not hold the bars together so well. The rice syrup is really thick and gloopy so holds them together really well and makes them lovely and chewy. Hi!! I’m super excited to try this but can you specify exactly which ingredients are the dry and which are the wet? Sorry for the silly question! Hi Aiden, Not a problem. I am sure if you are wondering lots of other people will be too, so I have amended the ingredients list to show the wet and the dry ingredients. I hope you enjoy them! This recipe looks wonderful. And if I sub agave, then I have everything in the house to make them. Time to get mixing! Thanks Laura! They are totally delicious! In fact I might make some again this afternoon! ? Thank you for including it Shannon! I love that you make your own pumpkin puree! That is next level! I have to do this, pinned to my pumpkin everything board! There is hardly any effort involved and anyway, I love roasting the seeds with olive oil, salt and pepper. If you buy a can you don’t get them so I would miss out! Thanks for pinning! I am so for pumpkin everything! I loved reading about your childhood love of pumpkins. I think that these would make a great snack for children and big kids too. I would love them with some chai tea. Great minds think alike….I always eat mine with a cup of Yerba Mate Chai! Thank you! Glad to have you here! ???? This looks like the most perfect on the go fall-inspired snack! The pumpkin patch looks amazing. I want to visit one soon. I’m also a pumpkin fan. Or food that’s orange in color. :-) So this season is perfect for me. I like all the ingredients in this recipe. I’m pinning this! Thank you Christine. I do hope you get to visit a pumpkin patch soon! Mmmmm, I can taste these already and I love them! Some of my favorite flavors here! Thanks Jenn! My favourite flavours too. You can’t beat pumpkin, nuts and chcocolate! I miss pumpkin patches! They don’t really have those here in the UK where you can go to during the fall. Pinning! Aaww I feel so sorry for all you guys without pumpkin patches! ???? Thanks for stopping by and have a great weekend! Do you mean pumpkin patches? It’s funny as when I was living in the UK I didn’t ever hear about them but now I don’t live there I notice that they are all over the place. Devon and Cornwall have quite a few too. I really regret not going to them when my son was small! Thanks Colette. It’s weird there aren’t pumpkin patches in the UK. It never crossed my mind when I lived there. Perhaps as pumpkins lay on the ground while growing they don’t do well in the UK because it’s generally a bit wetter? I’m certainly making up for years without them now! Hi Katie. It seems I have lost touch with UK grocery stores having been in Canada for so long! I’ve just had a quick Google and it seems rice syrup is available online in the UK. Amazon has some and a few online health stores. It’s a hard one to substitute. It has the texture of honey or golden syrup but isn’t so sweet. You could use honey or golden syrup but the bars will be sweeter so I would omit the sugar if you do. Obviously don’t use honey if you are vegan. Agave nectar would also work but again omit the sugar. http://www.food.com/recipe/pumpkin-spice-66963. I think I will add the link to the recipe later in case anyone else runs into the same problem! Oh I miss that picture of pumpkin patches. Thanks for reminding me of that wonderful view. We just don’t have that in UK. I make my own granola based on your recipe each week, adding different fits each time, for us now and the thought of adding pumpkin, or any of the squashes for that matter, and making a bar sounds like great fun. Thanks Su! I’m glad you liked the pumpkin patch picture and I’m also glad it generated some lovely memories! Pumpkins just aren’t such a big thing in the UK are they? I just love Halloween here. I’m sorry you will miss it ???? I do hope you get to eat some pumpkin though. It will remind you of the good old times here in Canada! Glad you’re still enjoying my granola too. It’s time o created some new flavours!